ISLAMABAD (AP) — The assault on the Chinese Consulate in Karachi was the latest in a series of attacks on China’s growing influence in Pakistan, where Beijing is financing tens of billions of dollars’ worth of megaprojects that critics fear will plunder the country’s resources and leave it with crippling debt. Friday’s attack, which killed two police and two Pakistani civilians, was claimed by ethnic Baluch separatists who have long accused the federal government of unfairly exploiting the oil and mineral-rich Baluchistan region. But concern about China’s growing involvement in Pakistan is more widespread. The relationship has come to be defined by the China-Pakistan Economic Corridor, or CPEC, a sprawling package that includes everything from road construction and power plants to agriculture — and has an estimated cost of up to $75 billion. The largest component is a 3,200-kilometer (2,000-mile) road linking China to Pakistan’s deep-water port of Gwadar on the Arabian Sea, a highway running directly through Baluchistan. CPEC, also known as the One Road Project, is part of China’s Belt and Road Initiative, a global endeavor aimed at reconstituting the Silk Road and linking China to all corners of Asia. In Pakistan, it has been billed as a massive development program that will bring new prosperity to the South Asian nation, where the average citizen lives on just $125 a month. Chinese firms have been contracted to build a number of coal-fired and hydro-electric power plants, as well as wind and solar projects. Other firms will be building new road and rail links between Pakistani cities and mass transit systems within them. China is also helping to expand and develop the Gwadar port. In addition to the big-budget items, China is also installing cross-border fiber-optic cables, an early warning system for the Pakistan Meteorological Department and experimental agricultural projects. The full cost of all the projects, and the exact terms of the Chinese loans, have never been made public. A recent report in the English-language Dawn Newspaper raised the estimated cost of the power and infrastructure projects from $46 billion to $57 billion. Pakistan is already mired in a financial crisis, and is seeking an $8 billion bailout package from the International Monetary Fund. The United States, which exerts heavy influence on the global lender, has said it will not support a bailout package that feeds Chinese coffers. Weeklong talks with the IMF in Islamabad earlier this month ended without a deal being reached, although negotiations are ongoing. 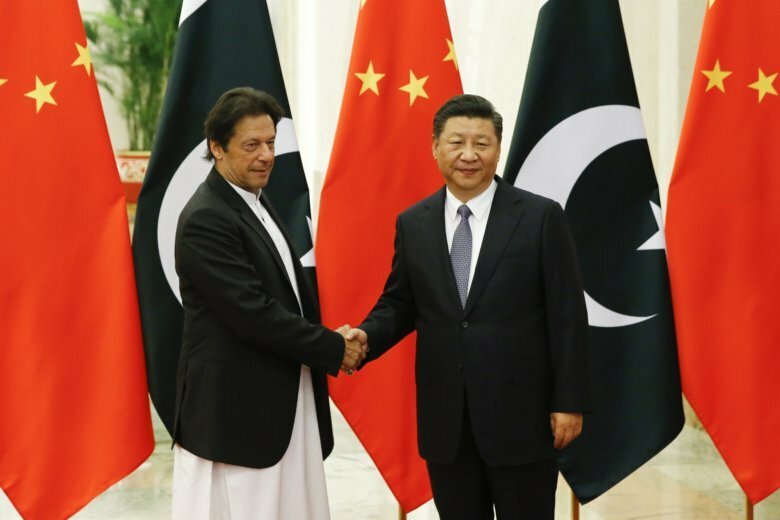 Pakistan’s new Prime Minister Imran Khan, who visited China earlier this month, has acknowledged the balance of payments crisis and vowed to renegotiate agreements that are not favorable to his country. But it’s unclear if China is willing to extend more favorable terms. The projects have inflamed longstanding grievances in Baluchistan and other areas, where residents accuse the central government of favoring the country’s Punjab province. Punjab is home to some 60 percent of the country’s 200 million people, and is home to most of the political elite. Baluchistan has long been the scene of a low-level insurgency by ethnic Baluchs, who want autonomy or outright independence. Other militant groups have also issued threats, and in October 2017 the Chinese Embassy requested additional security after a threat against the ambassador. China’s footprint has grown considerably in Pakistan, with some estimates saying about 700,000 Chinese nationals are currently in the country, directly or indirectly connected to the One Road Project. The International Crisis Group, a Brussels-based think tank, says a special security division comprising 15,580 soldiers and a maritime force has been tasked with protecting Chinese workers and Chinese projects. But that too could end up angering local residents. “From the project’s entry point, Gwadar, to its exit point, in Gilgit-Baltistan, the state’s response to local dissent and alienation has been an overbearing security presence, marked by army checkpoints, intimidation and harassment of local residents and crackdowns on anti-CPEC protest,” the Crisis Group said in a June report.